The law of diminishing returns… it’s something I presume we’re all familiar with? Essentially, the more you do something, the less appealing it becomes. It’s a universally true rule. Ok, unless you’re a heroin addict, in which case it’s the law of increasingly fun returns. But then again, who gets the last laugh when you’re crashed out on some random, filth-filled bed with a faint heart beat? The law of diminishing returns. See, it’ll get you eventually. Like Dog the Bounty Hunter. Even films occasionally succumb to this law – the more sequels a franchise spawns, the less appealing they ultimately become. You get an immense amount of deja-vu, the enjoyment falls and the frustrations rise… Does the latest instalment in The Hangover franchise buck this trend and leave you blissed out like a junkie, or does it leave you feeling dirty and used… like a junkie? I don’t think The Hangover is new news on anyone’s radars is it? The original story followed three guys as they quested to hunt down their one lost friend following a night of debauchery in Las Vegas. Let’s not beat around the bush, the original was fantastic and raised the bar for “this” type of humour. Many copycats would emerge, but few could top it. 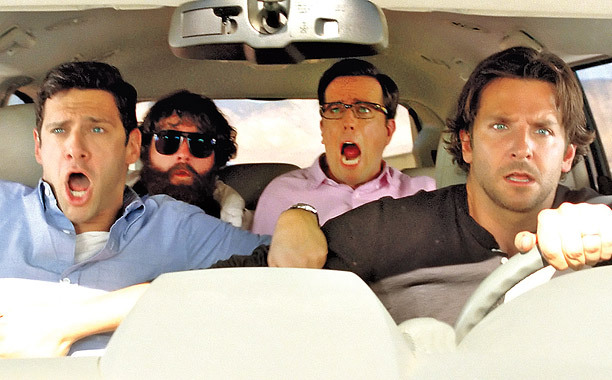 Then, back in 2011, The Hangover Part II emerged… and it brought more of the same. Well, that’s not entirely true. It almost brought exactly the same film to you. The location changed to Bangkok, but the jokes and pacing were near enough identical to the original. This pleased some (typically the easily-amused populace), but vexed the rest of us, as we knew the cast was capable of so much more. 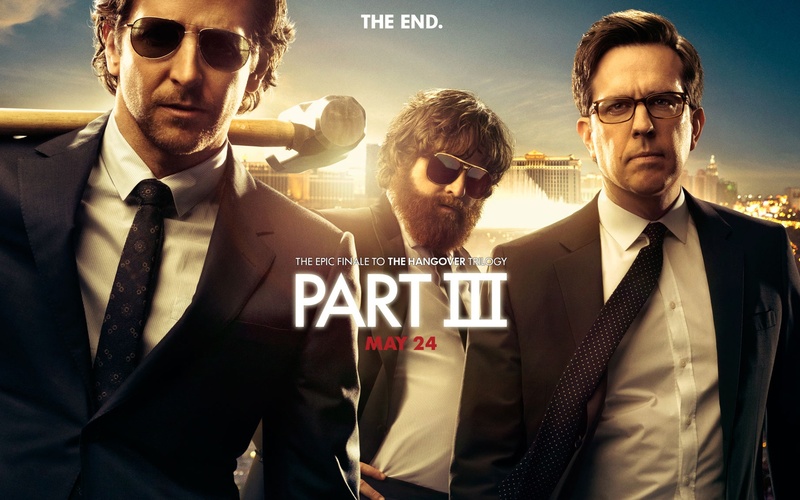 And so this brings us to The Hangover Part III – the final instalment in The Hangover franchise. Does it follow the same formula as its predecessors? Thankfully not. This, in itself, is a refreshing twist. There is no hangover in sight, the tone shifts somewhat and the laughs near enough evaporate from the entire film… Oh, wait, that’s not an altogether good thing is it? 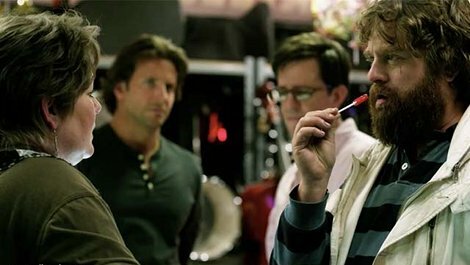 Briefly, the film once again follows Phil (my boy, Bradley Cooper), Stu (Ed Helms), Alan (Zach Galifianakis) and Doug (Justin Bartha) on another set of hi-jinx. This time, they’re charged with tracking down the always annoying Chow (Ken Jeong), as it turns out he robbed big time crook Marshall (John Goodman) of a cool $21 million. Marshall has therefore taken Doug hostage (so some things are the same as the first two movies… never mind Justin Bartha), and tasks the other three with finding Chow. Oh, and there’s also a sub-plot involving the fact that Alan needs to grow up and act his age, but that soon proves pointless. So, the film breaks with tradition and moves away from the “Why are we here? Where is Doug?” routine, but isn’t met with the greatest of success. The tonal shift of the film is quite stark; gone are the goofy send-ups and outrageous gross-out humour, which were the mainstays of the previous instalments. 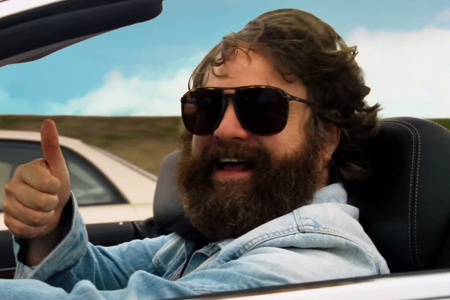 Well, mostly… you still have Galifianakis going full-tilt mental the whole way though, but that’s not an asset, which I’ll come to in a moment. But also gone is the air of mystery. In previous films I’ve genuinely cared about Doug and wanted to find out how the crazy chain of events led to him being where he was! Here? None of that. I found myself caring less and less about where they were going; primarily because they were chasing Ken Jeong. I didn’t want to see him on-screen again. His OTT Chow really destroys the film for me – I didn’t care for him much in The Hangover Part II, and the same is true here. 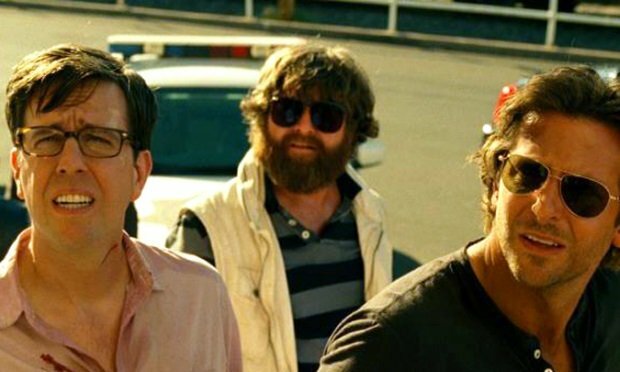 So once again the law of diminishing returns proves infallible, with The Hangover Part III being unable to hit those same blissful highs that it once was able to. Instead we do indeed feel like a junkie that wanted that “one last hit” before they quit… but that hit was too much and was like one long, bad trip. A bit like a hangover you might say, but at least with a genuine hangover you’ll get over it, pick yourself up and get out there again; you’ll erase those memories and replace them with something better. 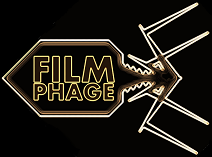 With this film though, it’s the last of the trilogy… so that dirty feeling you have? Well, it’s going to last… no more bliss for you! This entry was posted in Review and tagged Bangkok, Bradley Cooper, Chow, comedy, drugs, Ed Helms, Hangover, Heather Graham, John Goodman, Ken Jeong, Las Vegas, The Hangover 3, The Hangover III, The Hangover Part III, Todd Phillips, Zach Galifianakis. Bookmark the permalink. I have to agree with you here. A disappointing third showing from the franchise. The whole thing just felt really off to me. After the horrible second movie I promised myself I wouldn’t see the next one at the cinema and seems to have been a wise decision.